"The coming of war temporarily halted private commissions, but heightened the need for war workers housing. 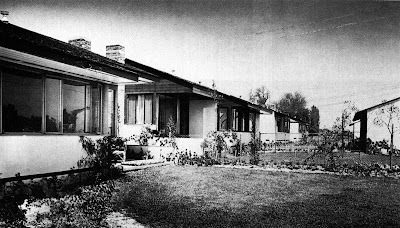 Neutra was given the job of designing a whole block of Progressive Builder's Homes, erected in 1942 as part of a larger project for defense workers at the nearby Lockheed aircraft factory in Burbank. Modest versions of the crisp, pitched-roof format Neutra had begun to explore two years earlier, the fourteen completed Federal Housing Adminstration sponsored, detatched dwellings featured bedrooms across the front with the living room running front to rear and opening integrally onto fetching garden patios." This set isn't as up to date as I'd like, I really need to set up for a weekend and take some nice current pictures. Photoset of some of the other Neutra-designed homes on the street, photos taken in 2007.